MostCreepy.com - If zombie apocalypse really happens, Pentagon already has a defense plan. This was revealed as the CONOP 8888 document was revealed. An unclassified document called "CONOP 8888" located on a secret military computer network. The document is about the process of dealing with zombies and surviving their attacks. It is said to be a guide for the military to isolate the threat of undead that can destroy the world. The plan is about some kind of zombies, pathogen zombies (zombies made through infection), space zombies, chicken zombies (this one really exists!). The US military does not really predict that the country will be dominated by zombies. But the discussion to make a real plan is real and true. Using zombies for a training is fun, in the report it says "People can imagine a new things, instructors are able to teach people about the basics of military " the author said. "If you ignore reality for a few minutes, a monotonous and confusing training scenario will turn out to be something more fun," they wrote in the disclaimer report. Zombies have no rights like humans, the report said. Thus, people free to counterattack zombies without considering laws. Given its bad nature and threats, countries with zombie outbreaks will be more comfortable under the supervision of military forces. Because zombies aren't afraid to die, the standard strategy of tense control is no use. And there are other additions, zombies also can't swim, as the document says. The only effective way to kill zombies is to shoot on their head. The only way to safely dispose a zombie corpse is to burn it. 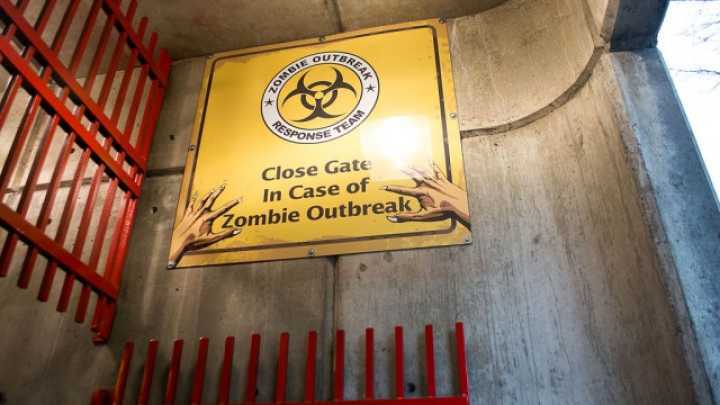 An effective response to zombie attacks must involve CDC. Because there is no known cure for zombies, CDC is the best resource for fighting zombies. In 2011, the agency wrote a blog post about how to prepare for the zombie apocalypse. The plan is to promote a real disaster preparedness (zombies are only hyperbole), but the post is spread immediately. Humans infected by a zombie outbreak might make the hospital full. Help from the world can help to fight the zombies. Gloves with the power to kill 99% of germs will be marketed freely. 1. Pathogen Zombie. Created by infectious agents; like in the movie "World War Z". 2. Radiation Zombie. Created by extreme radiation condition. 3. Evil Magic Zombie. The result of "occult experiments". 4. Space Zombies. Come from outer space. 5. Weaponized Zombies. Engineered by enemies. 6. Induction Symbiants Zombies. Similar to pathogen zombies, but they are created by a parasitic life forms, which do not kill the host immediately. 7. Vegetarian Zombies. Only eat plants. They don't attack human directly, but they may destroy our basic food crops. This report notes that normal zombies say "braaaaains", but the vegetarian zombies says, "graaaains". 8. Chicken Zombies. Yes Unlike the other zombies, this zombie is real.